Torture, industrial strife, social and economic inequality, massive privilege in the face of poverty, led poisoning: these are the issues and themes behind the Star Trek third season episode The Cloud Minders. This was another example of a story rewritten to soften the author, in this case David Gerrold’s, initial message expressing sympathy for a slave class and it is poorer for it. That said it has some interesting ideas and some eye-catching designs. 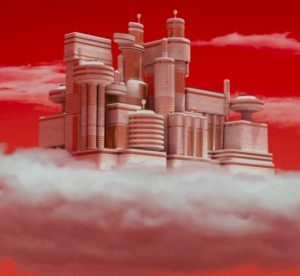 Not least of which is the Stratos cloud city based on the designs of the legendary Matt Jeffries. In this episode of Whom Pods Destroy – A Star Trek Discussion Podcast Graham, Derek and Terry have a really good chin-wag about this episode’s ups and downs. And of course its problematic female characters and the situations in which they find themselves. There’s also some more slagging of Fred Freiburger.